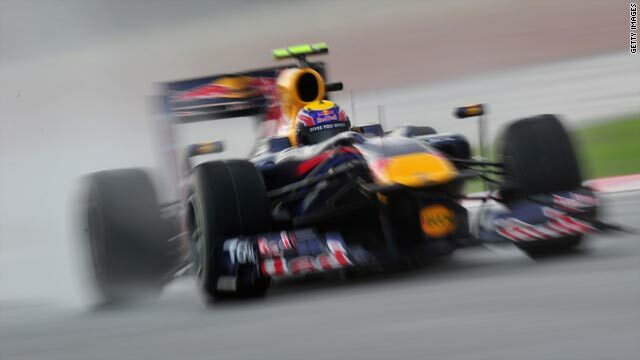 Mark Webber earned the second pole position of his F1 career in treacherous conditions in Malaysia. (CNN) -- Mark Webber gave Red Bull a third successive pole position of the new Formula One season as expected contenders McLaren and Ferrari paid the price for calamitous decisions during a rain-hit day of qualifying at the Malaysian Grand Prix. World champion Jenson Button, the race winner last weekend in Australia, will start Sunday's race from 17th and McLaren teammate Lewis Hamilton in 20th, with series leader Fernando Alonso 19th and fellow Ferrari driver Felipe Massa 21st. Both teams -- who head the drivers' and manufacturers' standings -- decided against going out in the early rain in the hope that conditions would improve, but were unable to set flying laps due to the downpour that delayed Saturday's third and final session. Webber clocked a leading time of one minute 49.327 seconds after gambling on intermediate tires, with Red Bull teammate Sebastian Vettel third with 1:50.789. Nico Rosberg, also using full-wet tires, claimed his best qualifying finish with second for Mercedes in 1:50.673, again outperforming his senior teammate Michael Schumacher. The seven-time world champion was back in eighth on 1:51.511, as Force India's Adrian Sutil qualified in fourth ahead of rookie Nico Hulkenberg, Renault's Robert Kubica and Rubens Barrichello in the second Williams. Button, who won in Malaysia last year, admitted that his team had made the wrong decision. "We read it wrong, basically. We thought the first rainstorm was it, and there was nothing else coming, so we waited. I guess events proved it was the wrong thing to do," the Englishman told Formula One's official Web site. "My first lap felt okay, it was quite wet but felt okay. Then on the second lap the first sector felt okay, but then it suddenly was very, very wet and I simply went off the track into the gravel. Obviously I was running on the wrong tires. The intermediates were not the best choice for those conditions. "I just hope that I've not damaged anything on the car, because I was sitting in the gravel with the engine running for quite a long time waiting to get pulled out. So yes, it is very disappointing. It was a very strange session with both Ferraris and both McLarens not making it into Q3." Red Bull have struggled to translate their qualifying dominance into race results, and Webber -- on pole for the second time in his eight-year F1 career --played down his chances of victory on Sunday. "We haven't executed the cleanest races so far this year. We have done a lot of great work on Fridays and Saturdays, but we know tomorrow is a big chance for us as a team to do well," the Australian said. "But tomorrow is a long race. This place can throw up lots of stuff in the two-hour duration of the race, so we are not getting too far ahead of ourselves, but we did what we needed to do today."